I don't think relics are allowed? My captain was 103 points. I'll update it with the complete breakdown when I get home tonight hopefully lol! I'll for sure have it updated before the event starts. Just a Captain with Combi-Grav and Powerfist. 42,016 They were, as Hazriel wielded the Fury of Baal. If they aren't this go around I'm okay with that, maybe float a re-roll for it otherwise? I've got a couple neat ideas brewing. Updated my earlier post with points. To be honest we don't have that many interesting relics anyway. It'll end up with people taking either the hammer for free or the jump pack for free, making the probably strongest build (Hammer, JP, Shield) even stronger while the other builds don't get anything from being able to take relics. Keep in mind that you can take a re-roll for 15p each. So up your Captain to 163p with 4 re-rolls. Relics aren't in the wargear section of the book, and as such aren't allowed (Also these are not armies and there is no warlord. both of which have to be met to select relics). As per above, add in some rerolls. Unless you think you dont need them! Edited by Xenith, 15 May 2018 - 08:15 PM. Lol! Gotcha! Will do. I thought you just added in rerolls later to bring points up to somewhat equal. I'll get that done now. Thank you everyone! Edited by Aothaine, 15 May 2018 - 08:26 PM. That's exactly what the re-rolls are for, but I'm not doing it for you! Edited by Xenith, 15 May 2018 - 08:46 PM. Lol! I think it is all done up correctly now. My apologies. OP updated with ruling on relics and Brother Alessandro. 6 more entrants needed before the kick off. Hey, Xenith, hold a spot open for me. My Goal is to have Calen finished in time for the FoB. I should be able to finish him by the end of RoS at the very least. If I finish him and get to do one of my lobby, TDAs I'm probably going t submit them instead. I'm doing Calen first because I need a finished Captain Smash before I need finished libbies. If you need to drop me for other participants no hard feelings! Not-Karlaen will answer the call. 😂 Im a fan of Neal Rakton - I think he's related to my characters Librarian Nostiphem and priest Olubroc! Im a fan of Neal Rakton - I think he's related to my characters Librarian Nostiphem and priest Olubroc! Bolter & Chainsword: Come for the pretty pictures, advice on painting and playing the game – stay for the fantastic culture of your fellow frater. Hey DBH, secure your place by posting your champion with his wargear in this thread, he-ll go onto the contestant board, and then when the feast starts, anyone inelegible (unpainted) will be kicked out - you have to be on the board in the first place though. Edited by Dont-Be-Haten, 08 August 2018 - 03:01 PM. Added Calen to the line up - great showing from the Successors so far, they're the only entrants! Edited by Zebulon, 15 August 2018 - 11:25 PM. Image to follow as he is part of my current ETL vow. Edited by Paladin777, 16 September 2018 - 05:04 PM. For the Glory of the Blood Owls comes a noble figure from the distant past. Chapter Master Volan Rebek, has emerged, flung far into his distant future by the vagaries of the warp, though only for a short time. Volan Rebek was Chapter Master of the Blood Owls from M40:371 to his death fighting the Dark Lord Vodar of Seth VI, in M40.982 His leadership saw the Blood Owls enter a time of immense glory, but also a time of immense loss. He was possessed of some small measure of his Genesire's foresight, and it left him deeply melancholic. He foresaw some of the tribulations that were to come to the Galaxy, and he could see no true success against their might. Though resigned to this loss, he was still a Son of Sanguinius, and it was his goal that the Blood Owls would enter the darkness of the coming days upon wings of glorious fire, selling each and every inevitable death fiercely. Strategically brilliant, but ultimately death-seeking, Rebek's campaigns bled the Blood Owls dry over his 500 year rule, and after his death, his successor, David Tegg, was faced with an enormous task to rebuild and rearm. Rekek was a giant of a man, but lacked the speed of his brothers. Slow to move, and slow to come to decisions, he made up for this lack through a fiercely analytical mind. Though he would struggle to match a brother blow for blow, each of his strikes would be so carefully considered and aimed as to bypass his foes' defenses, often laying them out with a single strike. 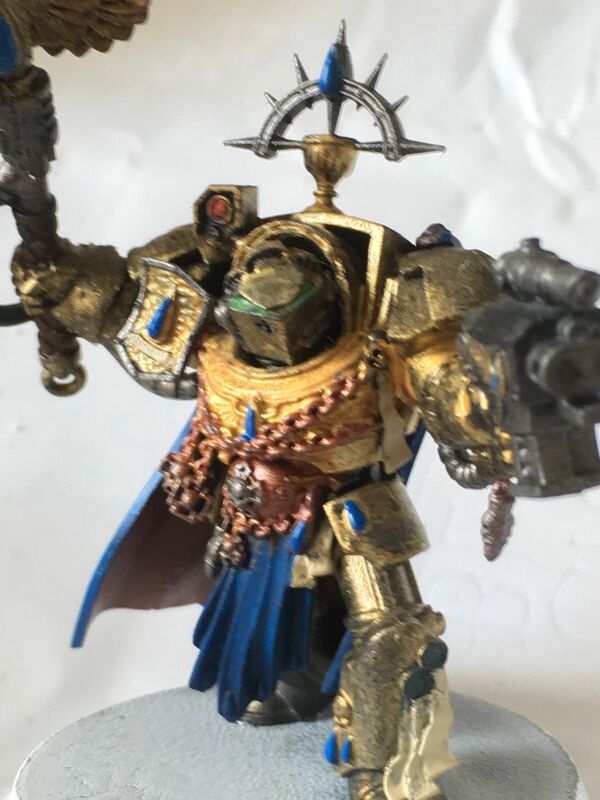 As befitted a Chapter Master of a Sanguine Successor chapter, he led from the front, clad in an ancient relic suit of Cataphracti Terminator suit, its ancient form standing as a beacon of glory long past. He led his brothers into the thickest of fighting, where their sacrifices would best turn the tide of the battle, often going hand to hand with such dreadful foes as Chaos Knights and Daemon Princes of the Dark Powers. He stands now at the Feast of Blades, a spectre of past glories and past mistakes made flesh. Glory shall be reclaimed, but destiny shall not be denied. He feels in the twin beatings of his hearts that this is a mere respite, and that upon the ending of the event, he will find himself once more upon the battlegrounds of his own time. Edited by CaptainHelion, 17 September 2018 - 10:27 AM. This should preferably be of a quality that I can crop out a headshot of them to put on the challenge table. Models that remain unpainted after RTS 2018 will automatically be disqualified, bringing shame upon their geneseed and the Primarch. Edited by Xenith, 23 May 2018 - 10:47 AM. * Or so I think. Will check when I have my copy of the codex in front of me. Don't forget to add your Champions backstory, guys. Mighty words for a Chapter that needed to get saved by the Knights of Blood. Edited by sfPanzer, 23 May 2018 - 10:45 AM. 6 Champions have thrown down the gauntlet, 6 Chapters represented at the feast so far. Good work folks! Edited by Xenith, 23 May 2018 - 10:49 AM.